“Winslow Homer: From Poetry to Fiction” opened at the museum on July 28, celebrating the engraved works of one of America’s most famous artists. Winslow Homer, a mostly self-taught artist of the 19th century, is well-known for his paintings and watercolors of American life and marine seascapes. However, Homer also created many engravings for Harper’s Weekly before his painting career took off, and a selection of those engravings are on view at FWMoA now. In honor of this exhibit, let’s explore what an “engraving” is in today’s Art Term Tuesday. Over the course of his 30+ year career, Stackhouse has refined his style. He almost exclusively crafts around the forms of ships and snakes, believing that a great artist doesn’t need an abundance of new information. He’s found what works for him, and if it’s not broken, he doesn’t plan on fixing it. FWMoA Exhibitions Content Manager Elizabeth Goings spoke to sculptor Darrell Petit, who created Continuum, about his inspiration, process, and love for Louis Kahn. Read the full transcription below or listen! We’ve already profiled one of our illustrious docents, but today we’re looking a bit more closely at what it is that a docent actually does. The word “docent” comes from the Latin docere, meaning “to teach.” Google the word, and that is what you will find on almost any website dedicated to docents, but we’re not here to talk dictionary definitions. 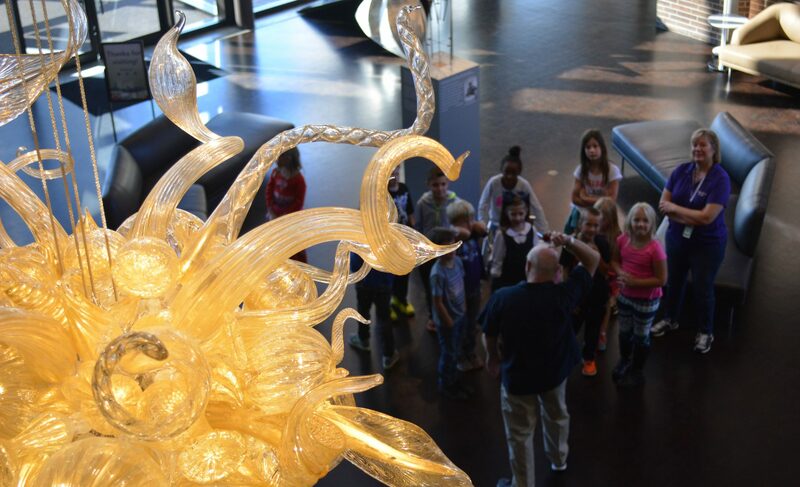 What do docents mean to FWMoA and the community we serve? Here in the education department we are often greeted with the familiar refrain of “I’m not sure an Art Museum is the place for my family” or “What will I do with my family in the Art Museum?” when we invite visitors out of the Midwest summer heat and into our wonderfully air-conditioned building. Maybe it’s a misconception about art being stuffy, or that people without art degrees feel unprepared to take their families through an art exhibition, or that art is just plain boring. Whichever one happens to be the case, taking kids through an art exhibit can be easy and fun! All you have to do is ask one simple question: What do you see? This week’s treasure is a peculiar curiosity. Instead of a painting or print, this week I present a Concert Roller Organ! What is a Concert Roller Organ you ask? Well, it was only the most fashionable form of entertainment for working class Victorian Era Americans. See and listen to FWMoA's Concert Organ play you a tune in the video at the end of this post!